This Black Bean Guacamole is a twist on traditional guacamole. 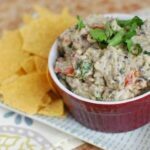 With added black beans and Greek yogurt, you get a full dose of healthy fats, fiber and protein…all in one great dip! Just popping in a with a quick recipe to share with you guys. Yes, I realize it’s green and the appropriate day to post a green recipe would have been yesterday, or even last week before St. Patrick’s Day….but you guys know me- always behind! So, recently I spent some time going back through all my posts from my first year of blogging. Considering I’ve been doing this for almost 4 years…it’s safe to say there are some recipe buried in the archives that many of you have never seen. I picked out some of my favorites and over the next few months, I’ve tasked myself with remaking them, taking better pictures and highlighting them for you guys! This is the first one- you can see the original post here! This is basically your average guacamole, just taken to a new level. I added black beans (which you can’t even taste) for protein and fiber and also mixed in some Greek yogurt for a protein boost! A twist on traditional guacamole. 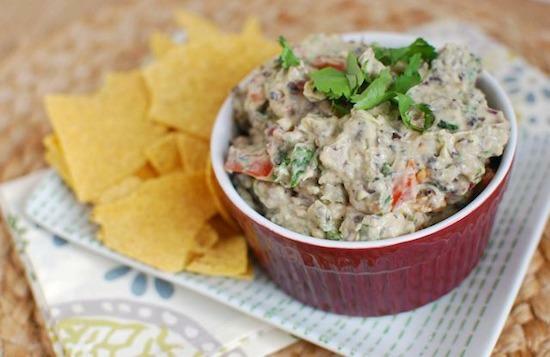 With added black beans and Greek yogurt, you get a full dose of healthy fats, fiber and protein…all in one great dip! Place the black beans in a small food processor and pulse several times. Add one of the avocados and the lemon juice and pulse until well mixed. In a small bowl, smash the remaining avocado with a fork. Add the black bean mixture, along with the onion, tomato, jalapeno and cilantro. Mix well and serve with tortilla chips. Almost shedding proud tears of joy knowing you’ve been an avocado fan for such a long time. Staying true to you. yum! you’re the best at making dips look pretty in pictures – i just haven’t figured out that touch yet! i love adding beans for protein and fiber – and you’re so right, you can’t even taste them! haha i’ve getting better but it’s still a challenge! Black beans and avocado. 2 of my favorite ingredients! Yum! Yum black beans and avocado! You can’t go wrong with that combination in my mind. Look forward to trying this! Oh thats so cool! Looks, and sounds great….and so much nutrition too! I am going to really focus on my nutrition after my next race. During this time, I like to try lots of new healthy recipes to keep my enthusiasm up, as otherwise I miss a lot of the junky stuff! This will be perfect! Thanks for the recipe! LOVE you refreshed this as I had missed it the first time. as, I bet, many of us had. Guac me! Love all kinds of guac- this looks awesome! I’d dip a chip in this! Two of my favs! Just pinned. I actually don’t like quac b/c I am not a fan of avocados, but this is something that I might be able to do! Yum yum yum. This is just perfect! YUM!! I love the idea to add black beans to guac! I am thinking this would taste quite fantastic with vegan yogurt or vegan sour cream too! This looks delicious! I usually am not a gaucamole fan even though I love avocados! Weird I know, but yours looks a lot more my style. I think its the lime that I don’t like about normal gauc?! gasp! not a guac fan!! 😉 maybe this will convert you! Who doesn’t love a good guac?! 🙂 I always love your recipes. I’ve never thought to put black beans in guacamole before but I like it! i like it too 🙂 let me know if you try it! Black beans and avocado are such a winning combination – I’m sure this guac is delicious! Thanks for sharing again. YUM! I love your riff on favorites! this looks delish and I most certainly will be trying it! What a fun way to make guacamole with more sustenance!!! It sounds and looks so good! Oh my goodness! I cannot wait to make this! 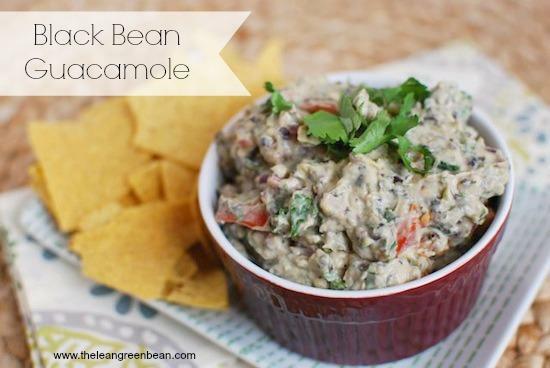 We love guacamole just as it is but I’d love to spruce it up by adding black beans! Sounds delicious! I’m kind of loving black beans lately, and avocados are always the best! Great recipe! How many servings does this recipe make? I need to make a substantial amount as an appetizer for 20 cheerleaders. They’re going to go crazy… Lookin forward to it! i would double or triple! Love guacamole! I noticed you sometimes make it as part of your Sunday prep. Just wondering how you keep it fresh? How long will it last in the fridge. My needs to be ate immediately or the texture seems weird or it gets all brown. Would love your tips! Put it in a container where there’s not a lot of extra space at the top for air, cover with a layer of plastic wrap in the container and press that down so it’s touching the guac and then put the lid on an airtight container. That should help! [WORDPRESS HASHCASH] The comment’s server IP (23.20.141.107) doesn’t match the comment’s URL host IP (54.225.119.123) and so is spam.